This standard covers the manufacturing, qualification, and quality assurance requirements for cross-laminated timber (CLT). Download ANSI/APA PRG 320-2018: Standard for Performance-Rated Cross-Laminated Timber, the current version of the approved standard. 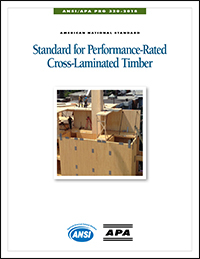 Download ANSI/APA PRG 320-2017: Standard for Performance-Rated Cross-Laminated Timber, the 2017 version of the approved standard. View the current ANSI/APA PRG 320 Membership Roster. To apply for membership, download the PRG 320 Committee Application Form.